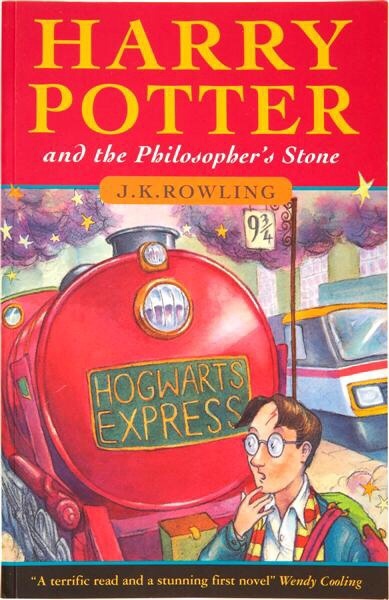 Harry Potter and the Philisophers Stone Illustrated Edition by J.K.Rowling is out on 6 October 2015. Illustrated by Jim Kay, it tells the the story of Young Harry Potter whose parents were murdered by the evil and powerful dark Wizard Voldemort when he was a child. Since then orphaned Harry has been living with his cold Muggle (non-magic human) uncle and aunt, Vernon and Petunia Dursley, with their spoiled and bullying son, Dudley who treat him more like a servant than a member of the family and force him to live in a cupboard under the stairs. At Hogwarts Harry meets Professor Dumbledore, Professor McGonagall, Professor Snape and half-giant Rubeus Hagrid and the first-years are allocated to houses by the Sorting Hat. the Hat suggests that Harry be placed into Slytherin which is known to house potential dark witches and wizards, but when Harry objects, the Hat sends him to Gryffindor, Slytherin’s rival house. Ron and Hermione are also sorted into Gryffindor. While Draco is sorted into Slytherin house. Harry and Ron then visit Hagrid (groundskeeper of Hogwarts), who lives in a cabin on the edge of the Forbidden Forest. There they learn that the attempted robbery at Gringotts occurred the day Harry withdrew money from his vault. During the first years’ first broom-flying lesson, fellow Gryffindor student Neville Longbottom has an accident and is rushed to the infirmary, meanwhile Draco steals Neville’s Remembrall and Harry Gives chase on his broomstick. Unbeknownst to Harry, Professor McGonagall, who is head of Gryffindor house, sees this and appoints him as the new Seeker for the Gryffindor Quidditch team (Rugby on Broomsticks). Later on Draco then tricks Harry, Ron, Neville and Hermione, into a midnight excursion, and they accidentally enter a forbidden corridor and find a huge three-headed dog which is standing on a trapdoor guarding something. Later At the Halloween Feast, Professor Quirrell reports that a troll has entered the dungeons and Harry and Ron manage to save Hermione from the rampaging Troll. Afterwards Harry sees Snape receiving medical attention from Filch for a bite on his leg caused by the three-headed dog. During Harry’s first game of Quidditch, Harry’s broomstick goes out of control, endangering his life. Luckily Harry regains control of his broom and catches the Golden Snitch, winning the game for Gryffindor. Hagrid refuses to believe that Snape was responsible for putting Harry in danger, but lets slip that he bought the three-headed dog (named Fluffy) and that the monster is guarding a secret that belongs to Dumbledore and a wizard named Nicolas Flamel. When Christmas break arrives, Harry and the Weasleys remain at Hogwarts while Hermione goes back home. For Christmas Harry receives the Invisibility Cloak which belonged to his father and also a flute from Hagrid. Harry uses the Cloak to search the library’s Restricted Section for information about the mysterious Flamel, and he happens to find a room containing the Mirror of Erised, which shows him his parents and several of their ancestors. After Christmas During Spring Term Harry finds out that Nicholas Flamel is a 665 year old alchemist who possesses the only known Philosopher’s Stone, from which an elixir of life can be extracted, later on Harry eavesdrops on a private conversation between Snape and Quirrell about the Philosophers Stone. The three friends also discover that Hagrid is raising a baby dragon in violation of Wizarding law and arranges to smuggle it out of the country around midnight. Draco, informs Professor McGonagall and Harry, Hermione, Draco, and Neville are caught breaking their curfew and sent with Hagrid to save a badly injured unicorn in the Forbidden Forest. Harry and Draco come across a hooded figure drinking the blood of an injured unicorn. Aware of their presence, the figure approaches the boys, but Harry is rescued by a centaur named Firenze, who offers to give him a ride back to the school. The centaur tells Harry that drinking a unicorn’s blood will save the life of a mortally injured individual, but at the price of having a cursed life from that moment on. Firenze suggests that it was the Evil wizard Voldemort who drank the unicorn’s blood to gain enough strength to make the elixir of life (from the Philosopher’s Stone), and regain full health by drinking it. Thanks to Hagrid, Harry learns how to get past Fluffy the three headed guard dog and suspects that Snape has tricked Dumbledore in order to steal the Philosophers Stone himself. So Harry Ron and Hermione decide to try and stop him themselves, After getting past Fluffy the Guard Dog they encounter a series of obstacles including a Life-sized Game of Wizard’s Chess a riddle and a magical Fire. In the final room, Harry, finds Quirrell, and discovers who tampered with his broom during his first Quidditch game against Slytherin, and who let the Troll into Hogwarts. He also discovers that Quirrell may be helping the Dark Lord Voldemort steal the Philosophers Stone in order to gain immortality…. The late, great Larry Walters (Better known as “Lawn Chair Larry”), sadly passed away 6th October 1993. Born 19th April 1949 he is best remembered as the American truck driver who took flight on July 2, 1982, in a homemade airship Dubbed Inspiration I, which consisted of an ordinary patio chair with 45 helium-filled weather balloons attached to it. Walters had always dreamed of flying, but was unable to become a pilot in the United States Air Force because of his poor eyesight. Walters had first thought of using weather balloons to fly at age 13 and 14, after seeing them hanging from the ceiling of a military surplus store. Twenty years later he decided to do so. His intention was to attach a few helium-filled weather balloons to his lawnchair, cut the anchor, and then float above his backyard at a height of about 30 feet (9.1 m) for several hours. In order to get back down he planned to use a pellet gun to burst balloons and float gently to the ground. So In mid-1982, Walters and his girlfriend, Carol Van Deusen, purchased 45 eight-foot weather balloons and obtained helium tanks from California Toy Time Balloons, by using a forged requisition from his employer, FilmFair Studios, and saying the balloons were for a television commercial. Walters attached the balloons to his lawn chair, filled them with helium, put on a parachute, and strapped himself into the chair in the backyard He took his pellet gun, a CB radio, sandwiches, cold beer, and a camera. When asked by a reporter why he had done it, Walters replied, “A man can’t just sit around.” Regional safety inspector Neal Savoy was reported to have said, “We know he broke some part of the Federal Aviation Act, and as soon as we decide which part it is, some type of charge will be filed. If he had a pilot’s license, we’d suspend that. But he doesn’t.” Walters received the top prize from the Bonehead Club of Dallas for his adventure, and also gets an honourable mention on the Darwin Awards website His flight was also widely reported in many newspapers.